How can I improve Windows performance in my virtual machine? I am not satisfied with my Mac performance when I run Parallels Desktop virtual machine (VM). I am not satisfied with Parallels VM performance. Using an outdated Parallels Desktop version or build. Too many resources assigned to the virtual machine. Too many virtual machines are running. Virtual machine performance is directly related to computer's hardware resources. It is also very important to allocate even shares of hardware resources between host operating system (macOS) and guest (VM) according to the recommended system requirements of both systems. Computer's performance mostly depends on several hardware components: CPU, RAM and hard disk. While CPU cannot be replaced at hand, most of Mac computers enabled for RAM and hard disk upgrade. 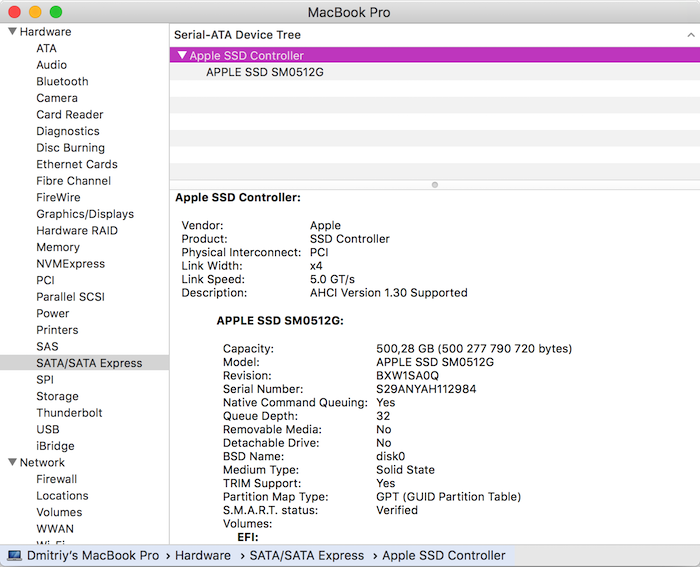 If your Mac uses a hard disk drive (HDD), it is highly recommended to replace the drive with a solid state one (SSD). This is the #1 recommendation for all Mac users which gives significant performance boost to Mac at 2-3 times. Contact your local Apple Authorised Service Provider to get assistance with the disk replacement. 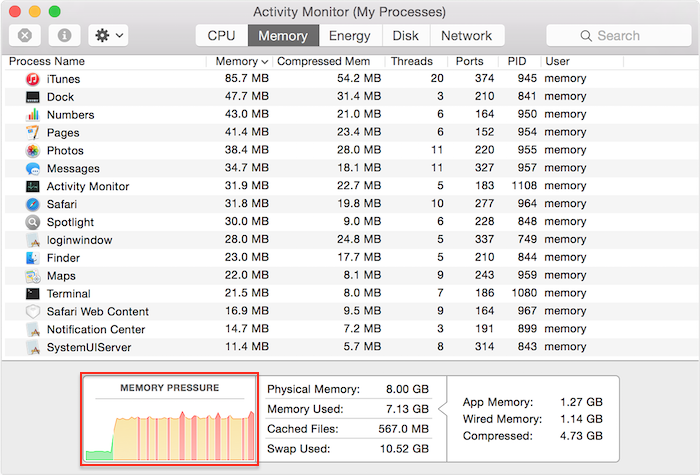 If you notice in Activity Monitor that your memory pressure is up to the maximum, it's time to check if your Mac allows you to do RAM replacement with higher modules capacity. Make sure that you have ample free disk space on your startup disk. Visit this article for more details: KB 123553. Use Activity Monitor to check what unwanted applications consume a high percentage of system resources (CPU and Memory). Make sure Time Machine backup is not taking place while you’re running the virtual machine. The backup process may slow down overall system performance. On the macOS menu bar click Parallels Desktop icon > Check for Updates.... Download and install the updates if available. Store your virtual machine within Mac HD (internal storage). Running a VM from external USB disk or NAS may significantly lower VM performance. Be careful running several virtual machines at once - each VM consumes considerable amount of resources and may slow down overall computer performance. Shutdown your VM > open its configuration > switch to Hardware tab > CPU & Memory > make sure that the number of processors (CPUs) selected is not maximum (e.g. 4 out of 4). In most cases, half of total CPUs will provide optimal performance. 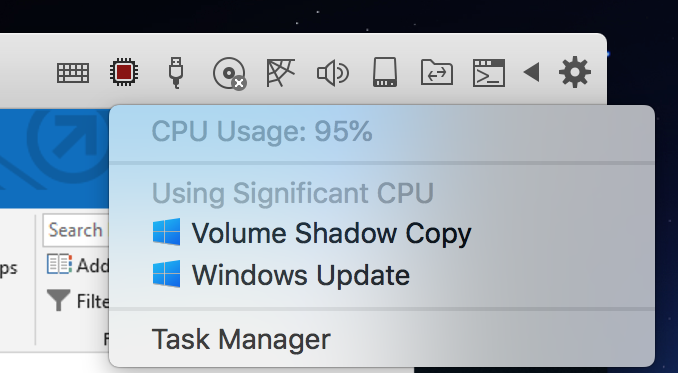 Assigning more than a half of CPUs for the virtual machine may cause performance degradation for both Mac and VM. Make sure that memory allocation is within the recommended level. Similarly to processors, best practice is to assign half of Mac's total RAM. NOTE: The amount of memory assigned to a virtual machine must be multiple of 1024 or Windows may behave inappropriately. E.g 1024, 2048, 3072 MBs and so on. 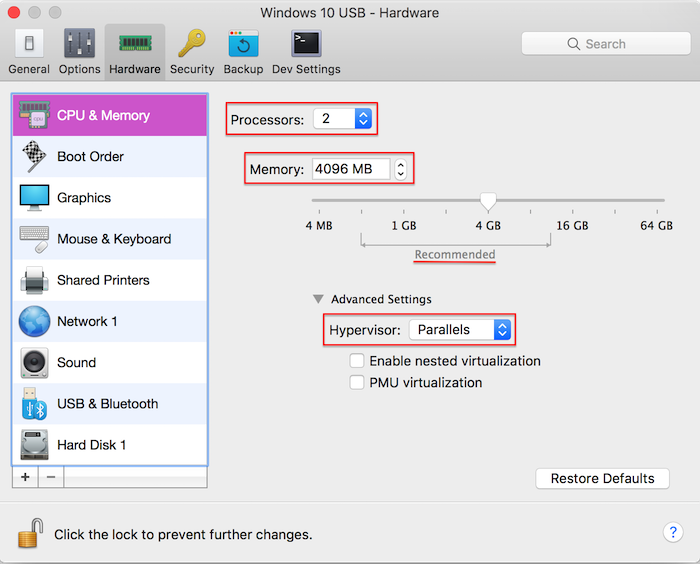 Under Advanced settings make sure that 'Parallels' hypervisor is selected. Under Hardware > Graphics set Memory option to Auto (Recommended). NOTE: For Windows 10 virtual machines make sure that under Advanced Settings 3D acceleration is set to DirectX 10. If your Mac uses an HDD or a FusionDrive (not SSD), make sure that the option TRIM is disabled: go to Hardware > Hard Disk 1 > Advanced Settings > uncheck Enable TRIM option. Start you virtual machine and test performance.